WendyBarrie-Wilson Student Comments Re:“Playing Shakespeare” Seminar with Wendy Barrie-Wilson. 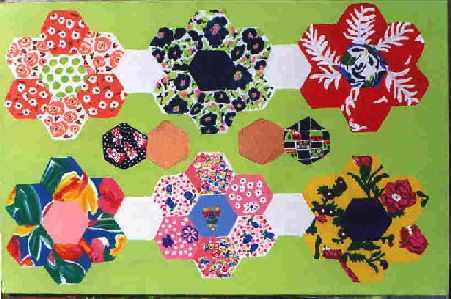 This is based on a quilt I finished when I was 18. My Mother (and Nana) had begun it when Mom was a girl. Over the years with all the washings, it was fraying badly. After repairing it this past year I decided to make parts of it last longer by painting some of the pieces that had the most memories for me. Some of these fabrics were my Nana's dresses, some my Mom's and some mine from the clothes I made in the 60's.